AKA, I’m having an Idea Garage Sale! It’s been a while since we did a themed shoot with our children, and while we have had odds and ends lined up for some time, a move, a baby, and a non-existent German spring have mostly kept us in hibernation. And speaking of fairy tales, now that we have no central heat or air for the first time in my life, thank goodness for this German Goldilocks weather… you know: not too hot, not too cold, JUST RIGHT. I never really intended to do a Red Riding Hood photo shoot, because I thought it was too cliche (which doesn’t make sense, really, but that was my rationale). I did, however, think that every girl should have a beautiful, princessy cape, so a year or so ago, I made my daughter a red hooded cloak (mostly because pink was not available in the velvet I was looking for). 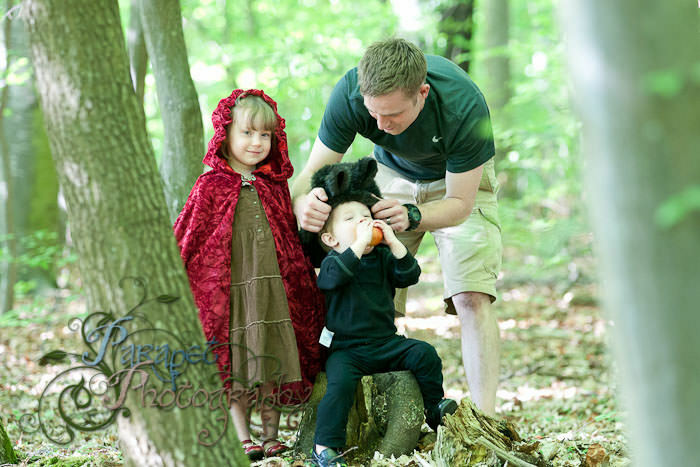 So when I finally warmed up to the idea of a Little Red Riding Hood cosplay and toddler LARP, I only needed a wolf. I did a lot of searches for wolf costumes for my son, because a bit of my sewing ambition has waned now that I have the power of three tornadoes– sorry, I mean children– keeping me on my toes. The pre-made costumes I found seemed either too hokey and cartoonish or a little darker and scarier than I wanted my two-year-old to be dressed, so I decided to make a simple one myself (Directions and photos below). I settled on the concept of a furry hood with ears, and otherwise I just dressed my son in all black. -(I also thought it would have been cute to put him in a tuxedo or suit with the wolf hood on). Proof that these shoots are a two-person effort, and there’s always something you don’t see going on behind the scenes… in this case, my son gleefully ripping the hood off every five seconds, and my husband patiently replacing it over and over and over again while distracting him with food. We are pros. This was a bit of a rough effort. I am pretty short on sewing time these days, so I kept things really simple. 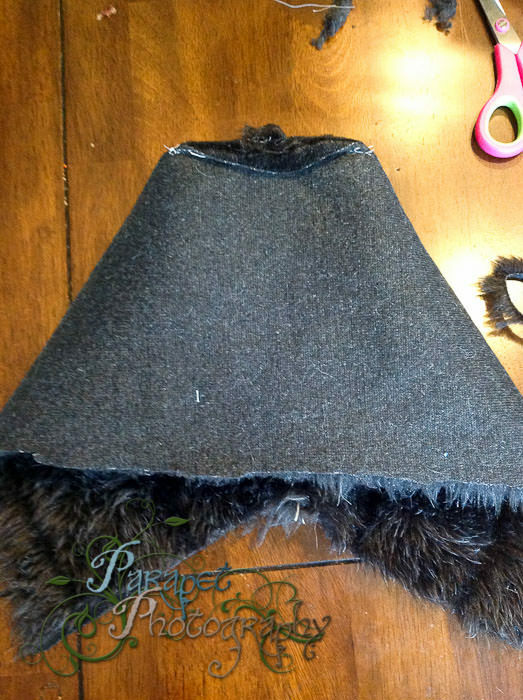 STEP ONE: I cut a bit of a hood shape out of a scrap of fur that I had left from another project. 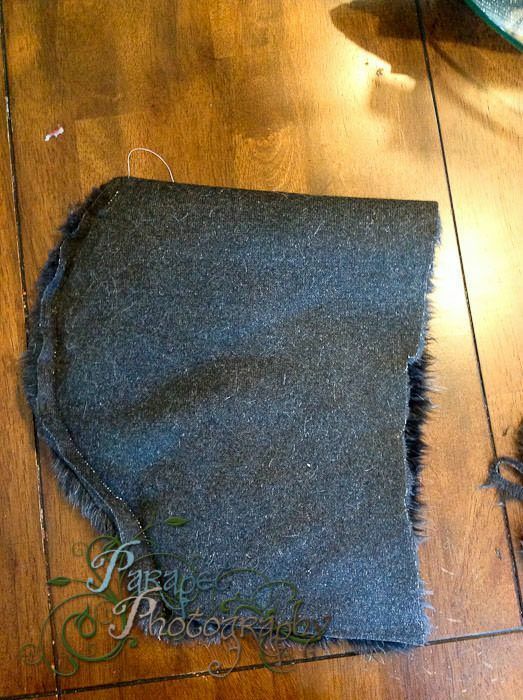 You’d probably need only about 1/3 yard, and still have some left if you want to try cuffs or a tail.. If I were doing this over, I would not taper the neck in, as it gave the whole thing a bit of a more tailored aspect… which in turn didn’t QUITE fit as well. So I’d skip that step unless you are measuring things MUCH more precisely than I did. As you can see, the fold is at the top. STEP TWO: Turn it inside and sew that bad boy up. 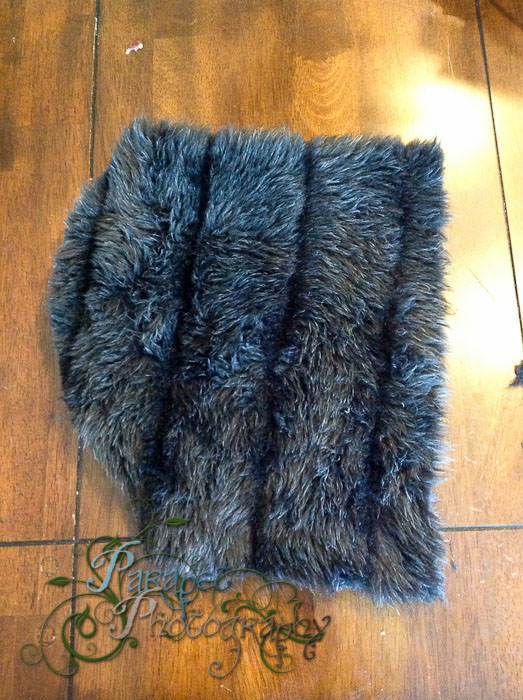 I used white thread to make the stitched more visible, but obviously, you’ll want to match your thread to your fur. 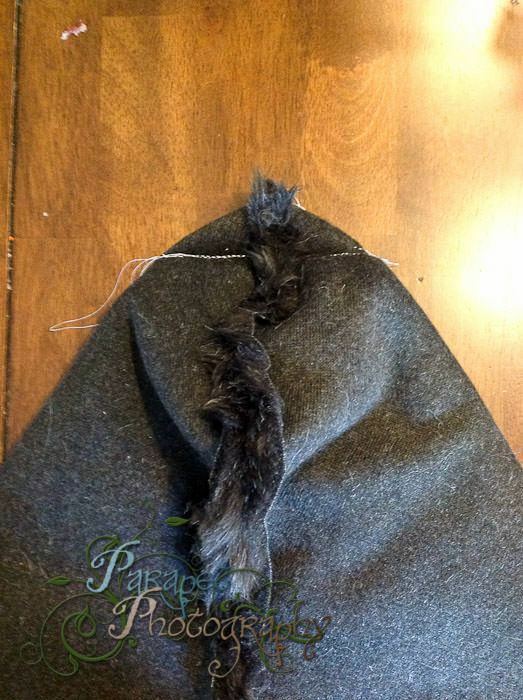 STEP THREE: This gives the hood its nice round shape over the crown of the head, but it can be difficult to explain: Pinch a cross-section of the very top of the hood and sew across in a bit of a curve, then trim. I’ve included a photo from the front and back. I’ve also included a random crumb on my table in the upper left corner. STEP FOUR: Your hood is finished! Now to make it a wolf, you’ll need some ears. Cut them (the folded view on the right), then slit the very bottom middle up about half an inch (not shown, but from the view on the right). 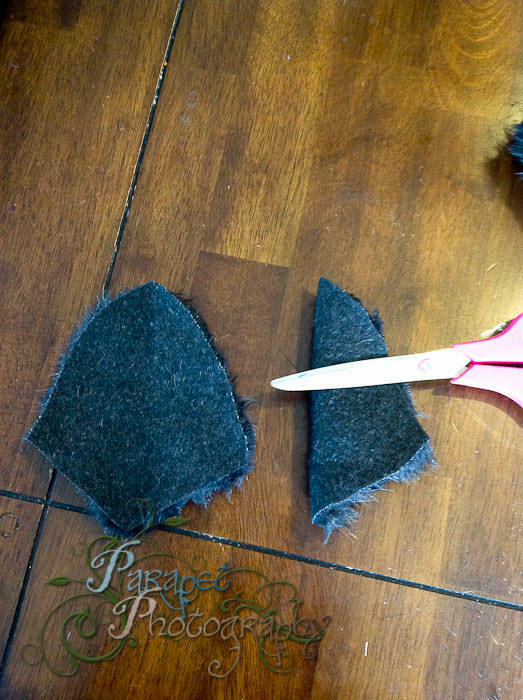 STEP FIVE: Fold the ears in half vertically, but right side out. You might pin this. Next, fold up the two flaps created by the slit you cut. 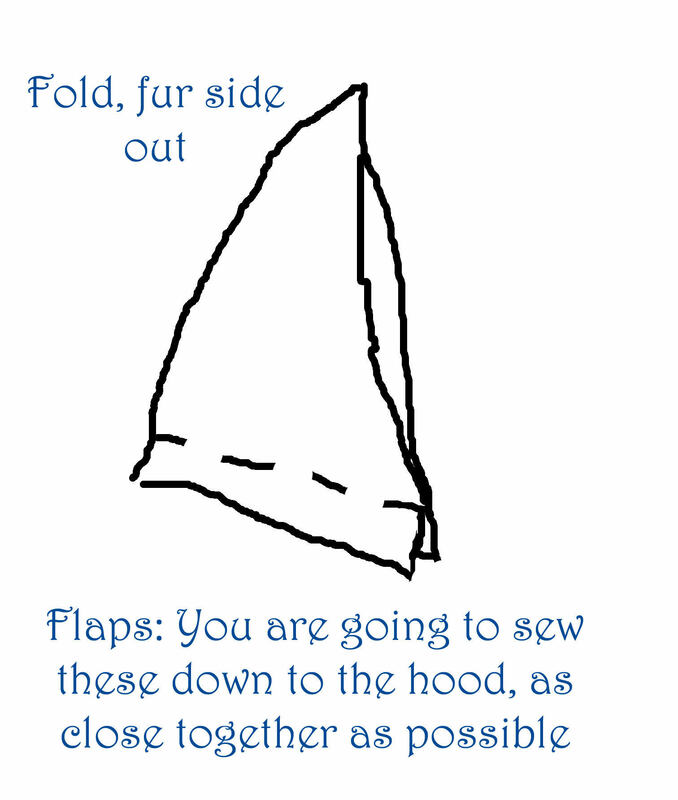 You will sew these slits down to the hood, as near to one another as possible. Voila: Ears! Mine turned out a little floppy, but I think it worked out okay.